President Donald Trump launched a barrage of attacks on Twitter claiming Amazon has taken advantage of the US Postal Service. Trump reportedly wants Amazon to pay more in shipping costs to the USPS, according to a Vanity Fair report. A UBS analyst says the move may have unintended consequences by causing Amazon to double down on its internal delivery efforts through Amazon Prime. You can view Amazon’s stock price in real time here. President Donald Trump’s threats to raise Amazon‘s costs of doing business with the US Postal Service (USPS) over allegedly taking advantage of the carrier could have unintended consequences, prompting the e-commerce behemoth to unleash its secret weapon – Amazon Prime. Yet the threats could induce Amazon to move away from using the USPS for deliveries by either going with other delivery providers or developing its own delivery service internally, particularly through Prime Now, Amazon’s service that delivers household items and essentials within two hours for free, according to one analyst. Should USPS raise shipping prices by between 5% and 25% for Amazon, it could represent a downside risk of 11-16% for the company, Sheridan says. However, he believes Amazon makes up around a quarter of USPS’s competitive products revenue, or revenue from package delivery as opposed to traditional first-class mail, reducing the likelihood that the postal service will go through with such a plan. Additionally, the key to Amazon’s e-commerce dominance has been its ability to deliver goods in a timely fashion and at minimal cost to both the distributor and consumer. Therefore, accelerated efforts to internally deliver goods from its fulfillment centres to their final destination would likely mitigate any intended effects of the postal service’s potential price hike. 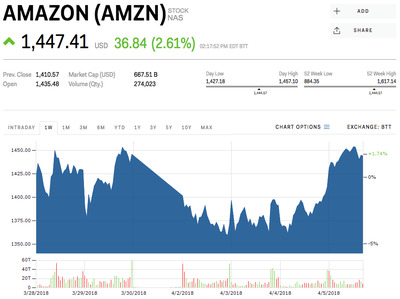 Despite slipping this past week, Amazon’s stock was trading higher on Thursday at $US1,445 per share. It was up 22.19% for the year. Read more about Amazon’s dominance in the cloud computing space.